Just hours ago, the Tron (TRX) Foundation took to twitter to let the crypto community know that the NiTRON Summit will begin in less than 13 hours. The event is scheduled to begin today, the 17th of January, and end tomorrow the 18th. The full tweet by the Tron Foundation can be found below. The event will be at the Yerba Buena Center for the Arts at 700 Howard Street, San Francisco. The event plans to bring together diverse guest speakers, blockchain developers, crypto enthusiasts and more. The summit will provide an opportunity for them to share ideas and better understand the blockchain industry. NiTRON is also meant to create new opportunities for entrepreneurs and investors who will be attending the event. Legendary basketball player, Kobe Bryant, will be a special guest speaker at NiTRON. Mr. Bryant will share his life experiences, insights and vision on entrepreneurship at the summit. He hopes to inspire young leaders and entrepreneurs. He shared the following words about this vision in a 2016 interview with CNBC. Playing basketball, the focus is always on winning. Winning championships, winning championships, winning championships. Now, championships come and go. There’s going to be another team that wins another championship, another player that wins another MVP award. But if you really want to create something that last generations, you have to help inspire the next generation, and they create something great, and then that generation will inspire the one behind them, right? And that’s when you create something forever. And that’s what’s most beautiful. Robin O’Connell – CEO, Uphold Inc.
With the budding list of guest speakers and the general excitement around the event, lots of Tron announcement are expected at NiTRON. Of particular important to the Tron community is how the BitTorrent (BTT) token will be successfully integrated onto the Tron platform. Most Tron investors are also aware of the BTT airdrop for all holders of TRX. Therefore, many crypto enthusiasts believe the NiTRON summit is the event where all this information will be made public. 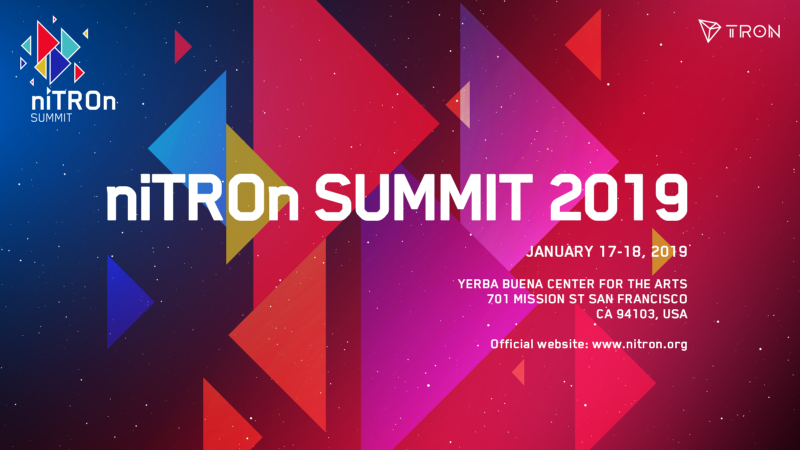 What are your thoughts on Tron’s Nitron event in San Francisco that starts today? What announcements do you expect to be made by Justin Sun and the Tron Foundation? Please let us know in the comment section below.